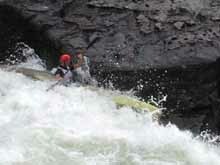 The Gauley River has been ranked among the top twenty rivers in the world, and with good reason. With twenty-seven miles of world-class whitewater and over one hundred named rapids, there is plenty of action for top-level paddlers. Every September for the past nine years, local event organizer Donnie Hudspeth has hosted the "Animal" Upper Gauley Race, considered one of the most challenging downriver events in the world. Andrew McEwan scrapes by Pillow Rock on his victorious run. Minutes later he was $1000 wealthier. The "Animal" takes place over the top nine miles of the Gauley, including the river's five most difficult rapids: Insignificant, Pillow Rock, Lost Paddle, Iron Ring and Sweet's Falls--all of which are rated class IV-V at a boat-crushing 3000 cubic feet per second release from the imposing Summersville Dam just upstream. Make no mistake, there is plenty of action in between the river's larger drops to thwart even the most seasoned elite racers. This year, the "Animal" was run in conjunction with the World Rafting Championships and was also being recorded for broadcast on the Outdoor Life Network (check with your local cable or satellite operator for times). As a result, major sponsors had jumped on board with an unprecedented $8000 cash prize purse and lots of gear. With so much at stake this year, USA Wildwater racers Andrew McEwan, Jess Whittemore, Chara O'Brian, Steve Kauffman and Chris Hipgrave all made the pilgrimage to battle the river for money and record race times. As reigning champion, Andrew went off first. Because he had not been practicing on location during the "Gauley season" weekends leading up to the race, and the rest of us had learned some pretty fast and sneaky lines, we hoped that one of us could beat Andrew for the first time. Next off was Steve, then Jess at a breakneck pace, myself, and Chara--followed by the other 100 or so competitors, any of whom could potentially challenge us for the cash. Andrew had a clean run through to the finish line, save at Sweets Falls where he bent the bow of this composite Wildwater boat ninety degrees to the right, still posting a very fast time of 45:03, just short of his record. Chara O'Brien takes Pillow Rock--and the women's title--with grace. Upstream, Jess managed to overtake Steve about halfway down the run when he became mixed up in raft traffic and ended up underneath one of these mobile undercuts. Steve managed to stay in his boat, but lost valuable time dealing with the raft and throwing a few select epithets at an oblivious guide. Steve trailed Jess over the finish line, though not before Jess had also damaged his boat. Jess, along with the Snyder Brothers, is an acknowledged "father of squirt boating" who gave us a sample of his deep water skills at the finish line. Having snapped his front wall in the maelstrom of Sweet's Falls, the water pressure flattened his bow to just a few inches wide, throwing him into a towering bow squirt that he rode out all the way to the finish--a very impressive stunt in a 4.5 meter Wildwater boat! Just upstream, Chris and Chara had clean, uneventful runs with little or no interference and looked strong over the finish line. While we dug into our 5th or 6th plates of food at the awards ceremony, the results where posted. In the men's division, Andrew McEwan maintained his reign convincingly and walked away $1000 wealthier. Chris Hipgrave came in second place, just 28 seconds back, with Whittemore and Steve Kauffman close behind. All in all, this was a very close race for the men. In the women's event, Chara cleaned up, besting the other women competitors by a huge margin and beating every other person (male and female) in her class, no doubt sweetening her $1000 cash reward. The Animal was a first-class race, with excellent T-shirts, extensive safety, video and photographers at all major rapids, and a smorgasbord of food and beverages right at the finish line. During this incredible riverside meal is a prize giving (and there are plenty of prizes!). I hope to see you there next year. 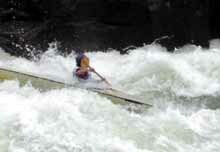 Chris Hipgrave is a US Wildwater Team K-1 racer training in Bryson City,North Carolina. Reach him at hipgrave.chris@gmail.com. Our illustrious correspondent takes to the pillow as relaxed and easily as a baby at naptime. Hipgrave captured a personal record and a second place finish overall.